On/Off switch and shutter button: You need to press the shutter button in two stages: Press and hold the button halfway and wait for the camera to initiate exposure metering and, if you’re using autofocusing, to set the focusing distance. Then press the button the rest of the way to take the picture. Exposure Compensation button: This button activates Exposure Compensation, a feature that enables you to tweak exposure when working in three of your camera’s exposure modes: P (programmed autoexposure), A (aperture-priority autoexposure), and S (shutter-priority autoexposure). Press the button while rotating the Command dial to set the amount of Exposure Compensation. In M (manual exposure) mode, you press this button while rotating the Command dial to adjust the aperture setting. Info button: Press this button to display the Information screen on the camera monitor. The screen not only enables you to easily view the current picture-taking settings, but also enables you to adjust some settings more quickly than by using the camera menus. To turn off the screen, press the Info button again. 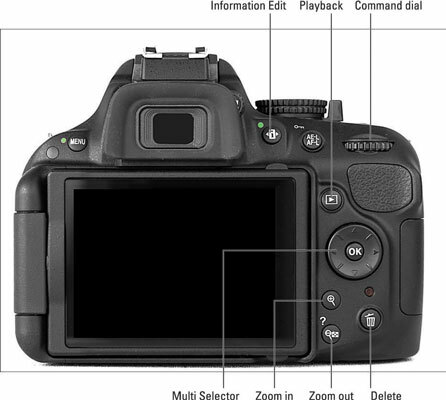 You also can display the screen by pressing the Information Edit button on the back of the camera (see the figure) or by pressing the shutter button halfway and releasing it. These methods are easier, so you might use the Info button only when you want to turn off the screen. Live View switch: As its name implies, this switch turns Live View on and off. As soon as you turn on Live View, the scene in front of the lens appears on the monitor, and you no longer can see anything through the viewfinder. You then can compose a still photo using the monitor or begin recording a movie. Movie-record button: After shifting to Live View mode, press this button to start recording a movie using the default recording settings. Press again to stop recording. Release Mode button: Press this button to change the camera’s shutter-release mode. By default, the option is set to Single Frame, which results in one picture each time you press the shutter button. You also can opt for Self-Timer mode, Remote Control mode, and a few other settings. Mode dial: With this dial, you set the camera to fully automatic, semi-automatic, or manual exposure mode. Setting the dial to Effects enables you to apply special effects as the image or movie is captured. AF-assist lamp: In dim lighting, the camera may emit a beam of light from this lamp when you use autofocusing. The light helps the camera find its focusing target. If you’re shooting in a setting where the light is distracting or otherwise annoying, you can disable it via the Built-In AF-Assist Illuminator option, found in the Autofocus section of the Custom Setting menu. On the flip side, there are some situations in which the lamp is automatically disabled: It doesn’t light in Live View mode or during movie recording, for example. The AF-assist lamp also shoots out light when you use red-eye reduction flash and the Self-Timer shutter-release mode, both covered in Chapter 2. You can’t disable the lamp for these two functions. Flash hot shoe: A hot shoe is a connection for attaching an external flash head. When not in use, the contacts on the shoe are protected by a little black cover; remove the cover to expose the contacts and to attach the external flash. 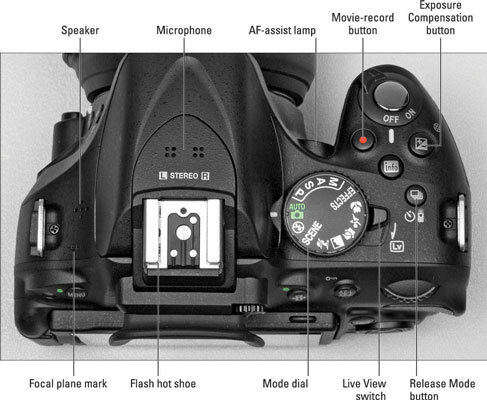 Microphone: The two clusters of holes labeled microphone in the figure lead to the camera’s internal stereo microphone. You also can attach an external mic via the port found under the cover on the left side of the camera. Speaker: When you play a movie, the sound comes wafting out of these little holes. Focal plane indicator: Should you need to know the exact distance between your subject and the camera, the focal plane mark is key. The mark indicates the plane at which light coming through the lens is focused onto the negative in a film camera or the image sensor in a digital camera. Basing your measurement on this mark produces a more accurate camera-to-subject distance than using the end of the lens or some other external point on the camera body as your reference point.